Nearly all forms of cannabis are illegal in Texas. And by illegal, I mean very illegal. Possession of a small amount of cannabis concentrate–what we in the legal states know as a $30 vape cartridge–is a felony in the Lone Star State. I recently had the chance to tour one of those companies. 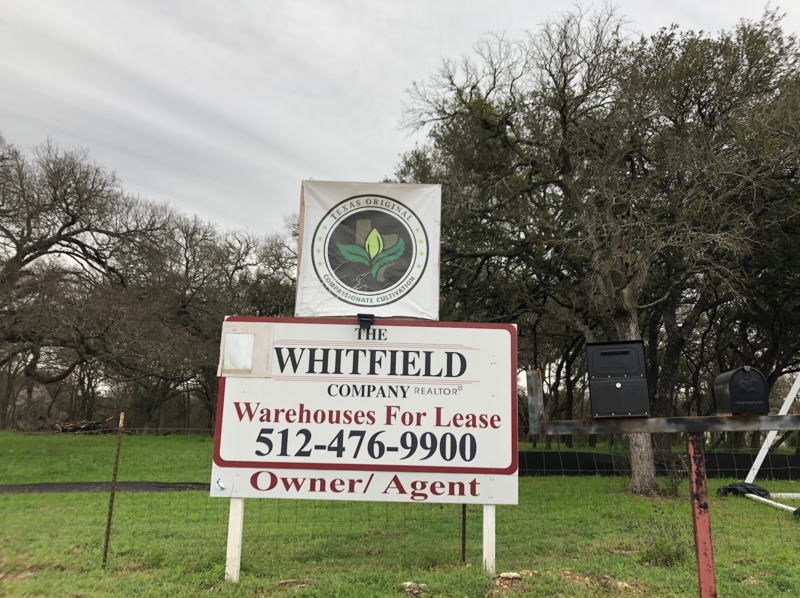 The home offices and grow facility of Compassionate Cultivation are tucked away in Manchaca, a little farm town on the outskirts of Austin. It’s not encased in barbed wire, but it’s not exactly advertised, either. A small vinyl sign bearing a vague sprouting-seed logo–not the typical marijuana fan leaf–stands in a lonely field of live oaks. John Volkmann, the company’s chief marketing officer, greeted Leafly News Editor Ben Adlin and me in the front office of a light industrial warehouse facility. “Welcome to our dispensary,” he said. Ben and I looked around, confused. We saw a waiting room and a receptionist. And… that’s it, Volkmann explained. There are no products in retail display cabinets, no budtenders, no jars or chopsticks. Most patients order their medicine online and receive it via delivery, Volkmann told us. Those who visit in person receive one-on-one consults there in the waiting room in Manchaca. Texas is an enormous state. You could fit all of France and Switzerland inside its borders. How does Compassionate Cultivation deliver? “We run a fleet of Priuses,” said Volkmann. “We need to be able to deliver medicine to Laredo, El Paso, Houston,” wherever their patients reside. The state’s Compassionate Use Act, implemented in early 2016, is a very controlled program. In fact, it’s not overseen by the state health department, as most medical marijuana programs are. It’s run by the Texas Department of Public Safety–the police agency that also manages the Texas Rangers and the Texas Highway Patrol. The strict law allows patients with intractable epilepsy–the only qualifying condition–to consult with a state-registered specialist who may recommend low-THC cannabis oil. There aren’t a lot of these physicians. In all of Travis County, which includes Austin, the state registry lists only four. (Patients can search for those registered physicians here.) The physician then enters the patient’s name into the Compassionate Use Registry of Texas (CURT), an online portal that the state’s three dispensaries can use to verify that a patient qualifies. Smokeable flower is not allowed. All flower and leaf must be converted to cannabis oil products. 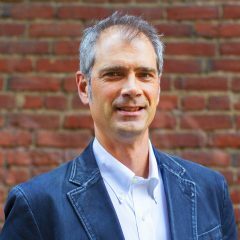 “We have a pretty constrained cannabis opportunity here,” John Volkmann acknowledged. It’s so constrained that Leafly doesn’t technically consider Texas a legal medical marijuana state under our definition of the term. Here’s the problem: The medicine produced by Compassionate Cultivation and its two competitors, Knox Medical and Surterra Wellness isn’t much different in potency than the mail-order CBD products proliferating across the United States. When Congress passed the farm bill late last year, it included language that offered more legal wiggle room for hemp-based CBD producers. By law, hemp is cannabis that contains less than 0.3% THC. Licensed medical cannabis in Texas contains less than 0.5% THC. Those unlicensed CBD oils, which typically contain double-digit percentages of CBD and minute traces of THC, are commonly ordered online and shipped through the US Postal Service. Unlicensed CBD remains illegal in Texas, farm bill notwithstanding. That doesn’t mean people here don’t purchase it online, but most law enforcement agencies see proactive enforcement as a waste of tax dollars. So why invest millions of dollars in a CBD oil startup that’s so restricted by state law? Compassionate Cultivation and its two competitors seem to be playing the long game: stay strictly compliant with state law now and be ready when legislators open the system to more patients and qualifying conditions. Indeed, even as we ended our tour, legislators in Austin were considering a number of bills that would do exactly that. And Volkmann pointed out something else his company was delivering to patients: safety and reliability. Unlicensed hemp-based CBD oil is completely unregulated. Past studies have found that some products deliver far less CBD than they promise. Other products may contain contaminants such as mold or heavy metals, because no product testing is required. At Compassionate Cultivation, the company grows its own low-THC strains of cannabis onsite. It’s also in the process of breeding new strains, such as the high-CBD cultivar called Waterloo. Experienced technicians extract cannabinoids and terpenes. A state-of-the-art lab tests the products to make sure they’re delivering what patients expect. It’s a multimillion-dollar operation just waiting for its patient base to expand. Hear more from John Volkmann and others at Compassionate Cultivation in a bonus episode of The Roll-Up podcast, Cannabis in Texas. 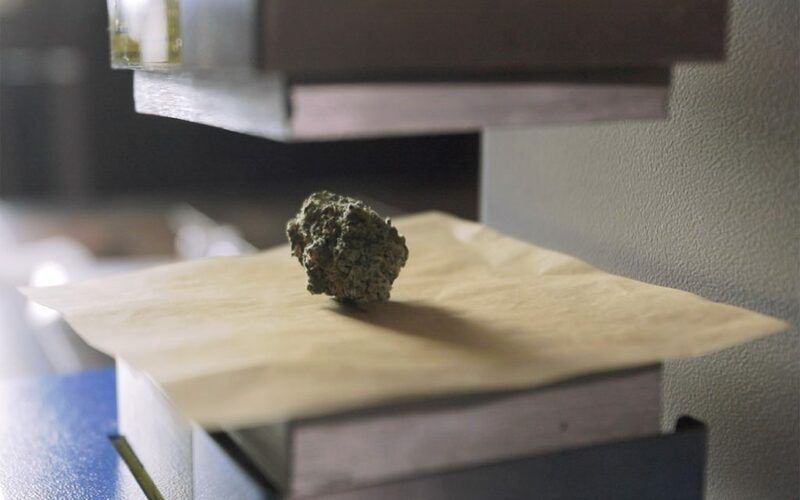 The term “Kush” is as familiar with cannabis enthusiasts as “puff, puff, pass.” The word is derived from cannabis that originated in the Hindu Kush mountain range, but culturally, most of us have used it to describe high-grade cannabis. With there being so many Kush-named strains on the market, we have to wonder: are here notable similarities or differences between them? To answer this question, we looked at the terpene profiles of four popular THC-dominant Kush strains: OG Kush, Kosher Kush, Kimbo Kush, and Bubba Kush. This composite chemical data was provided by Confidence Analytics, a leading testing lab in Washington. 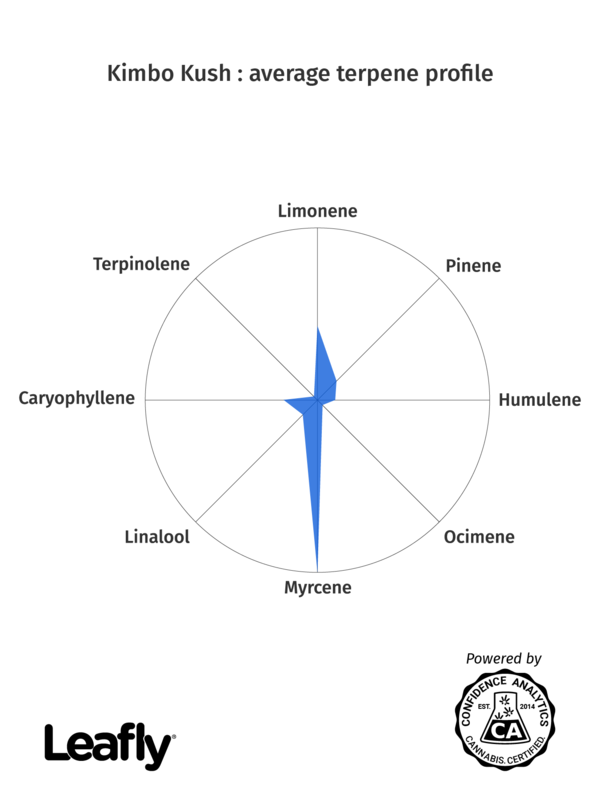 Terpenes are the aromatic compounds within cannabis that provides its aroma and flavors. When you smell skunk, grape, lemon, berry, or pine–those are the terps talking. It’s believed that terpenes shape the experience of cannabis by interacting with our bodies and other compounds such as THC and CBD. 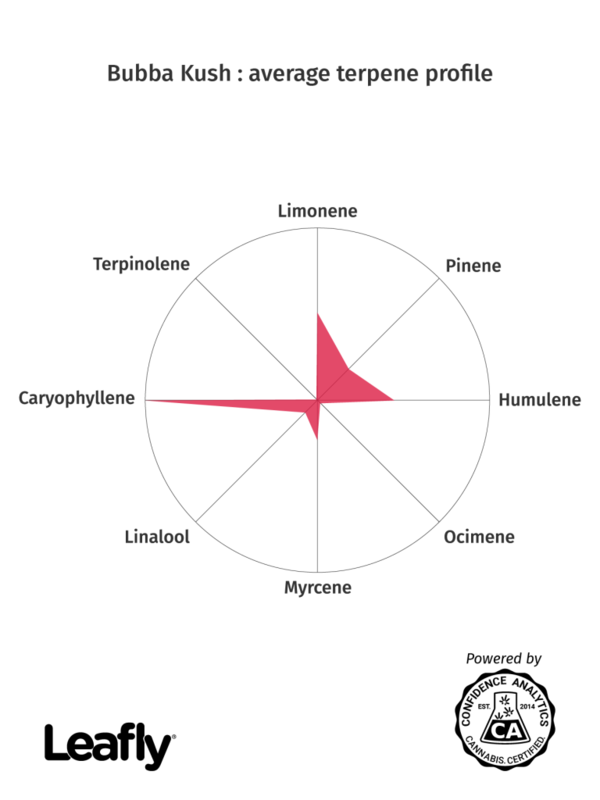 The average terpene profiles of four Kush strains–overlaid in the graphic above–look similar, suggesting that they may provide similar experiences. But when you break down the data for each individual strain, each has a different story to tell. Originally bred in Florida, then brought to California to get that real good grow love from Josh D, OG Kush is one of the most influential cannabis strains of all time–although its genetic lineage is murky. According to Josh D, OG Kush is a cross between an unnamed strain from Northern California and a Hindu Kush varietal from Amsterdam. 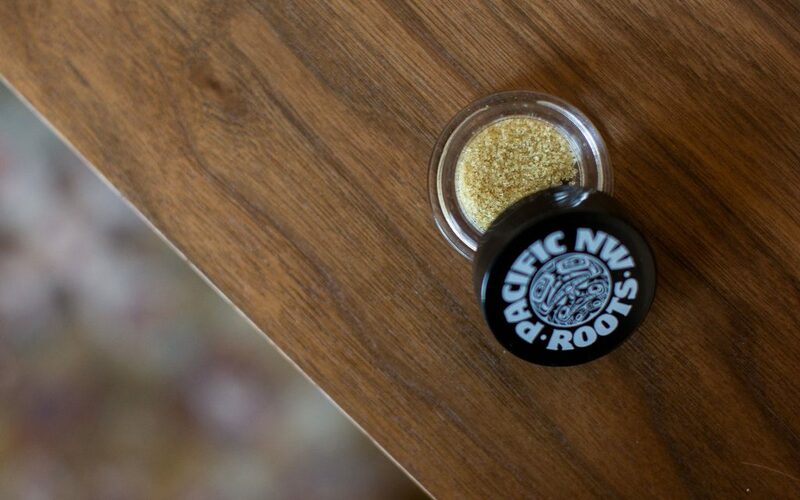 Its aroma features pungent funkiness, hints of lemon, and gassy undertones. OG Kush expresses abundant amounts of caryophyllene, limonene, and myrcene. These terpenes are believed to relieve stress and anxiety, and promote relaxation in the mind and body. OG Kush also contains a moderate amount of linalool, pinene, and humulene–terpenes which may reinforce this strain’s relaxing effects and offer potential therapeutic benefits like inflammation relief. At this point, we understand that cannabinoids and terpenes can affect each consumer differently. Personally speaking, OG Kush provides a heavy, yet manageable high. It can put me down if I’m already in a tired or chill state of mine, but the high generally isn’t too sleepy or couchlocking. For other consumers, OG Kush is that knockout punch that’ll send you into Dreamville. That’s why lab data is important–it helps you understand how different amounts of cannabinoids and terpenes affect you personally. Kosher Kush is one of the most prolific phenotypes of OG Kush. While a brilliant reflection of OG, Kosher Kush’s terpene profile looks a bit different. 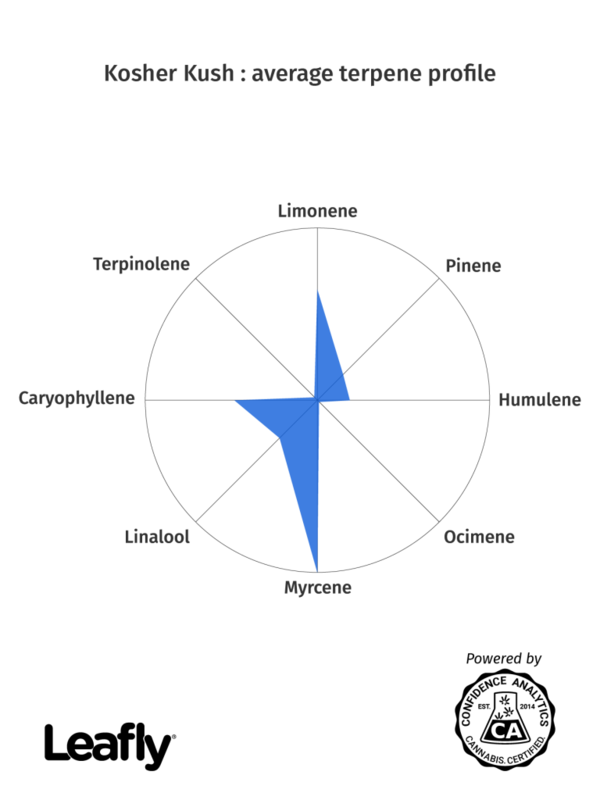 While still influenced by linalool, humulene, and pinene, Kosher is clearly dominant in myrcene, followed by limonene and caryophyllene. Though some find Kosher Kush to carry a sweeter aroma than OG Kush, the two tend to provide similar experiences. It personally leaves me with a body full of feel-good, however some consumers say Kosher Kush provides a ZzzQuil-like experience, especially when consumed in exorbitant amounts. Kimbo Kush is a cross between Blackberry Kush and Starfighter. Though not a descendant of OG Kush, Kimbo produces a similar terpene profile to Kosher Kush. Also dominant in myrcene with limonene and caryophyllene trailing behind, Kimbo Kush tends to offer a heavier-than-average experience. While this strain is influenced by multiple terpenes, myrcene–which is believed to reinforce the potent punch of high-THC strains–is indeed the most abundant. 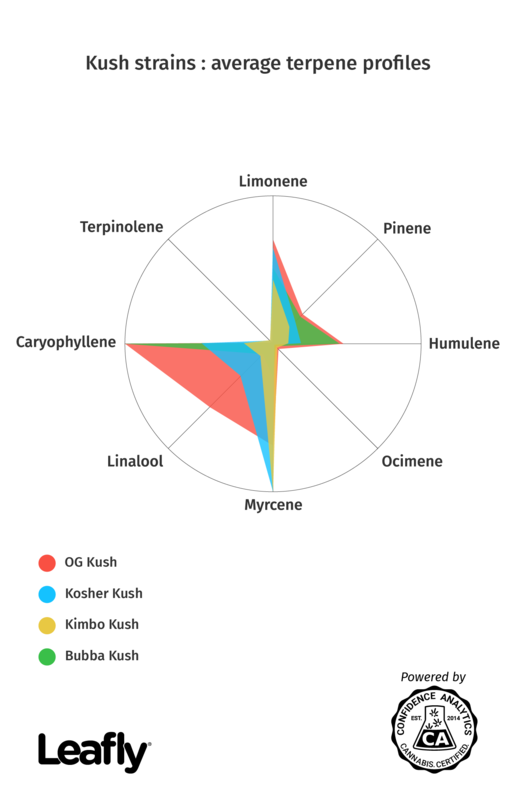 Out of all of the observed Kush data, Bubba Kush is the biggest outlier in terms of terpene profile. 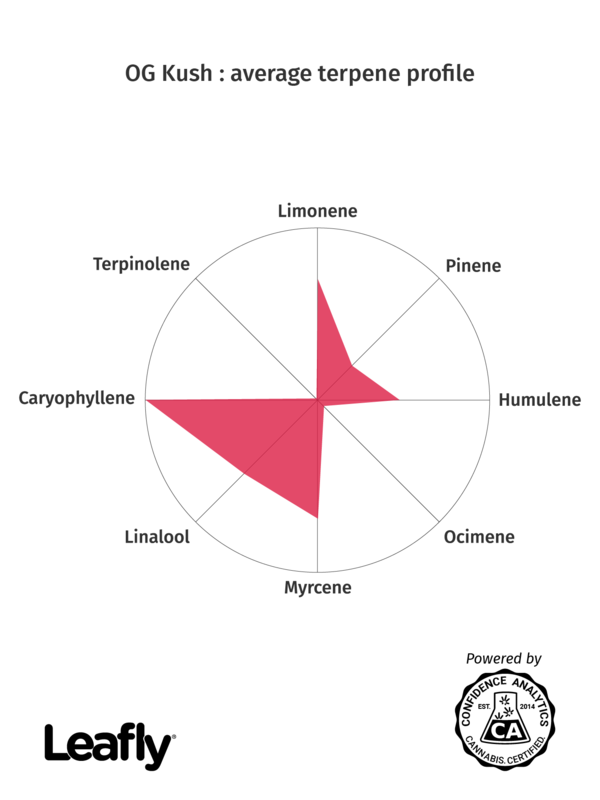 Dominant in caryophyllene and abundant in limonene and humulene, Bubba Kush is the only strain in our dataset that produces lower levels of myrcene. Bubba Kush is the only strain in our dataset that produces lower levels of myrcene. Considering most consumers seek Bubba Kush for its relaxing experience, it’s surprising that it contains very little of the terpene that cannabis enthusiasts associate most with the couchlock effect. Bubba Kush is a perfect example of why you can’t attribute the effects of cannabis to a single terpene. Every terpene affects the perceived experience, and this goes to show how important it is to consider the complete symphony of cannabinoids and terpenes when selecting a strain. Gottlieb’s presence mattered because he made CBD one of his high-priority issues. In the cannabis industry, Gottlieb’s departure raises immediate questions about the status of cannabidiol (CBD), the popular, nonintoxicating cannabis component. Congress’ passage of the farm bill in late 2018 seemed to open the door to nationwide CBD legality. But the DEA still considers nonprescribed CBD to be an illegal Schedule I drug, and many legal scholars caution against assuming that CBD is legal just because it’s available in a growing number of mainstream stores. Gottlieb’s presence mattered because he has made CBD, along with nicotine vaping and opioid abuse, one of his high-priority issues. Just recently, Gottlieb told a congressional committee that the FDA was “deeply focused” on finding an appropriate way to handle CBD. Some public health experts and activists took the news of Gottlieb’s departure hard, in part because the former physician and venture capitalist has been considered one of the most competent Trump appointees. NPR described Gottlieb as “widely viewed as an effective advocate of public health,” and some praised his team’s work cutting tobacco and opioid deaths, lowering teen nicotine use, and reducing the cost of generic drugs. How many jobs are there in the legal cannabis industry? It’s a common question–and one the government refuses to answer. Because cannabis remains federally illegal, employment data agencies such as the Bureau of Labor Statistics ignore all jobs related to the industry. Legal cannabis is the greatest job creation machine in America. Our employment data proves it. That’s too bad, because they’re missing one of the most dramatic job booms in recent history. There are now more than 211,000 cannabis jobs across the United States. More than 64,000 of those jobs were added in 2018. That’s enough people to fill Chicago’s Soldier Field, with 3,000 more tailgating outside. Legal cannabis is currently the greatest job-creation machine in America. The cannabis workforce increased 21% in 2017. It gained another 44% in 2018. We expect at least another 20% growth in jobs in 2019. That would represent a 110% growth in cannabis jobs in just three years. 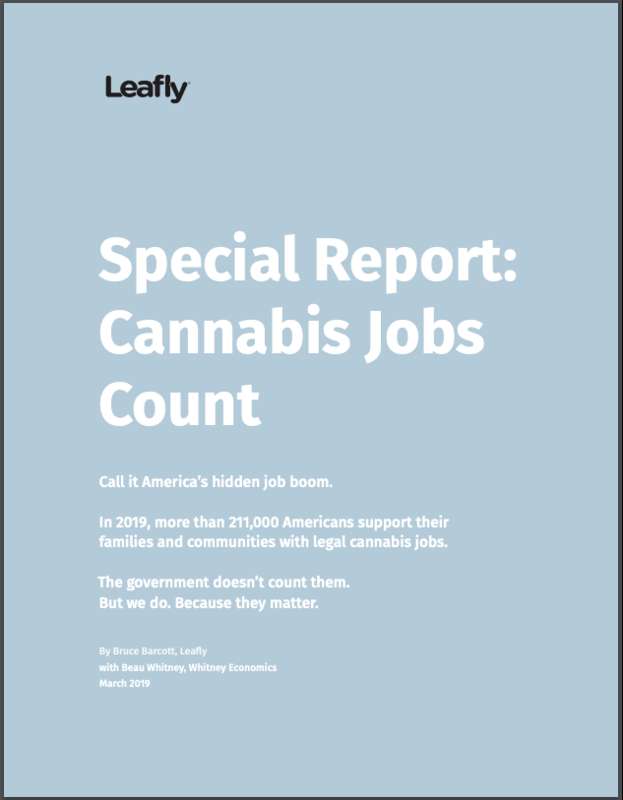 Special Report: 2019 Cannabis Jobs Count is available only at Leafly. The main report offers a national overview of direct employment as well as indirect positions and jobs induced by the legal cannabis industry. We also offer data about tax revenue in legal states, growth predictions for 2019, salary ranges for the most in-demand cannabis jobs, and tips on getting hired. The report’s appendix offers a state-by-state analysis of market size, growth, and job numbers. The Bureau of Labor Statistics recently compiled a list of the industries with the fastest-growing employment figures. Opportunities for home health care aides are expected to grow 47%. Openings for wind turbine technicians are expected to increase 96%. The need for solar voltaic installers is expected to grow 105%. Those gains are projected to happen over the course of 10 years. Here’s the incredible thing: The 110% growth in cannabis jobs will have happened over just three years. Federal job counters won’t tell you that. We just did. Some states that have had legal adult-use cannabis sales for a while now–Colorado and Washington opened their stores in 2014–are just now seeing the growth in cannabis jobs start to plateau. 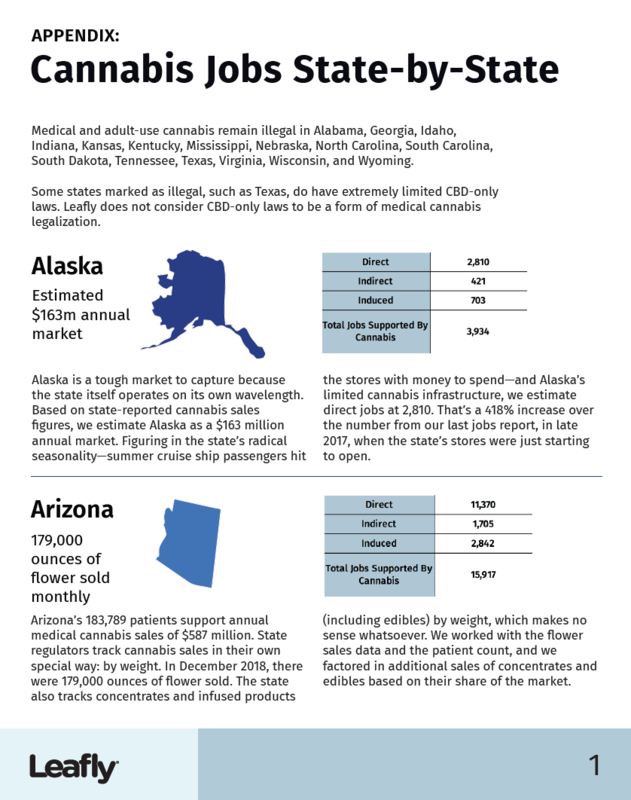 Click to download Leafly’s state-by-state analysis. California, Massachusetts, Oklahoma, Florida, and Arkansas are seeking talent–and they need it now. California’s cannabis hiring remained relatively flat in 2018 due to the disruption caused by the changeover from an unregulated medical system to a licensed, regulated markets for medical and adult use. But we expect cannabis jobs in the Golden State to increase by 21% in 2019. In raw numbers, that means 10,261 jobs with good salaries, benefits, and opportunity for advancement are waiting to be filled. In Massachusetts, the state’s adult-use market is just getting underway. We expect more than 9,500 jobs to be added in the next 12 months. Florida should add more than 5,000 jobs in 2019, bringing the state’s total cannabis employment to around 15,000. Oklahoma is the Wild West of cannabis right now. There were zero cannabis jobs one year ago. Now there are 2,107. A year from now, we expect there to be 4,407. Arkansas is just getting its medical marijuana program underway, but there’s room for growth: from 135 jobs now to 960 jobs by the end of the year. All this week, Leafly will roll out a series of articles about working in the cannabis industry: where the growth is, what it’s like to work in the cannabis industry, and how to crush that job interview and bring an offer home. The world’s biggest, most influential cannabis market generated around $300 million in taxes in its first year of commercial legalization. And it did it with both hands–and one foot–tied behind its back. Today, the California Department of Tax and Fee Administration released its final tally for cannabis sales and excise tax receipts for 2018. California collected about $300 million in cannabis sales taxes and fees for the first year of commercial sales. That’s lower than initial projections for 2018–which was the first year of legal sales. But the amount is far greater than totals from any other state that also legalized cannabis the year California did, in 2016. Three years ago, California, Nevada, Massachusetts, and Maine voters all ended cannabis prohibition at the ballot box–calling for taxing and licensing the robust state trades. Commercial sales got started first in July 2017 in Nevada, followed by January 2018 for California, and fall 2018 for Massachusetts. Maine’s former Gov. Paul LePage blocked implementation, so the state collected zero tax dollars on its cannabis trade. Massachusetts may collect $60 million in its first year, which is ongoing. Nevada collected $69.8 million in its first year. Those are tiny fractions of California’s tax total, because the state is so much bigger. You can see the legal cannabis industry gaining strength in the most recent numbers, which cover the fourth quarter of 2018. In total, California’s roughly $300 million tax haul in year one of commercial sales is more than three times higher than the state ever collected on annual medical marijuana taxes over the last 23 years. California budget-makers had initially hoped to collect $655 million in year one cannabis taxes, on the way to an estimated target goal of $1 billion in annual tax revenue. That year one estimate had to be revised down, because about 75% of cities and counties in the state banned cannabis commerce. However, such bans are typical of early implementation. Colorado, Washington, and Oregon also had a majority of cities opt out of the jobs, salaries, and tax revenue of legalization. Over time, more and more ban cities and counties come around. California promises to follow the same route. Also missing from the tax picture are totals for local sales and excise taxes, which can run as high as 20%. With year one done, cannabis tax collections are on pace to hit the target $1 billion mark within three years–lightning speed after more than 80 years of prohibition. But many see the industry as underperforming due to current tax rates. Rep. 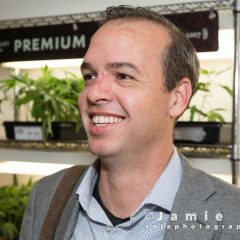 Rob Bonta has introduced a bill to pause the cultivation tax, and lower the excise tax for a few years. The goal is to draw price conscious consumers into stores, and tax-sensitive growers into the regulated market. But Rep. Bonta’s bill needs a super-majority in both houses to amend Proposition 64, and become law. Last year, a cannabis tax cut bill died in committee. Lawmakers worried it would decrease tax revenue at a time when state officials are in the mood to raise more tax revenue, not less. California has an annual proposed budget of $209 billion, so cannabis tax revenues neither make nor break local or state budgets. Most cannabis tax revenue is earmarked to pay for state cannabis regulators, followed by funds for police, public health, and social justice programs. But for comparison, California’s first year of cannabis taxes could pay the average annual salaries of an extra 4,166 teachers–double the number employed in the Sacramento Unified School District. California’s first year of cannabis taxes could pay the average annual salaries of 3,542 additional police officers–eight times the number of cops in the Sacramento Police Department. Once you’ve decided to start growing cannabis at home, you can easily fall into an overwhelming green hole of information: What strains are easiest to grow? What’s the optimum cycle for indoor lights? Should you grow in soil or coco coir? Use sprays or opt for integrated pest management? It’s enough to drive anyone mad–or at least to the nearest dispensary. Thankfully, there are lots of excellent resources online–including Leafly’s own dedicated section on growing–and many of them provide helpful information for the general grower. But what about growing locally, right here in Massachusetts? I wanted to know whether there were specific tips and tricks for growing here in the Bay State. So I headed to the INSA cultivation facility in Easthampton to learn more about what it takes to grow cannabis successfully in New England. INSA’s cultivation center is state of the art and truly makes a home grower salivate. From its water filtration system to the various grow rooms where plants can be seen in different stages of their lifecycle, it was impressive to see cannabis grown on a large scale. Thankfully, you don’t need a cutting-edge grow center to get a good harvest at home. 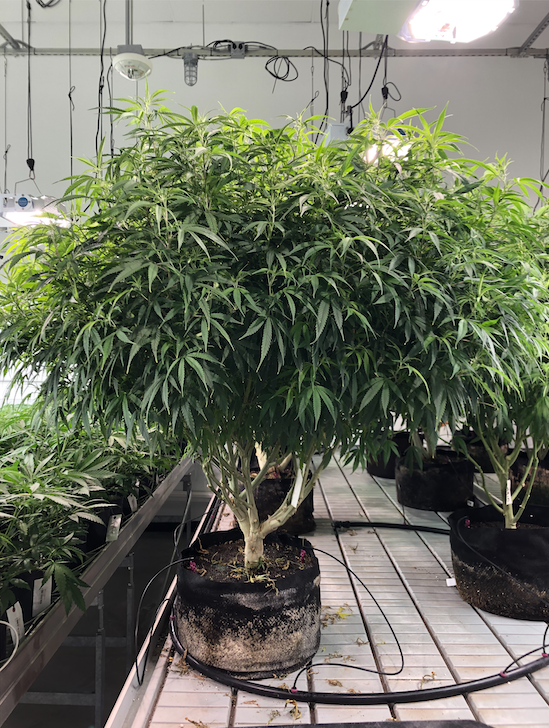 INSA head grower Matt Livermore and assistant head grower Frank Golfieri shared some Massachusetts-specific tips they’ve cultivated over the years. If you’re planning to grow outdoors in Massachusetts–the season here lasts roughly May through November, by the way–make sure you choose the right strains. “You have to find specific ones for this region,” said Golfieri. “You can’t just grow anything, especially with the way the climate is out here. You have to find strands that are more hearty, to handle these conditions.” Kush strains are good options for beginners to consider. Both Livermore and Golfieri recommend starting from seed if possible to avoid any surprise issues that may be brought into your grow space. When starting with clippings or clones, you can’t be positive that they won’t introduce bacteria, pests, or other pathogens into your garden. Golfieri advised, if you have the space, that you keep new plants in quarantine for a little while to avoid letting introduced pathogens spread to existing plants. If you’re taking advantage of the outdoor grow period, it’s important to be aware that it stretches across three different seasons–spring, summer, and fall–each with its own specific weather. While fall in other regions may be more temperate, Massachusetts tends to have more rain. Our long, relatively autom thus creates perfect conditions for things like mold to develop. And while Massachusetts isn’t not known for long periods of scorching heat in the summer, there are frequently spells of little to no rain that can cause issues if you’re unable to water your plants regularly. There’s not much that compares to the sight of a majestic, outdoor cannabis plant. 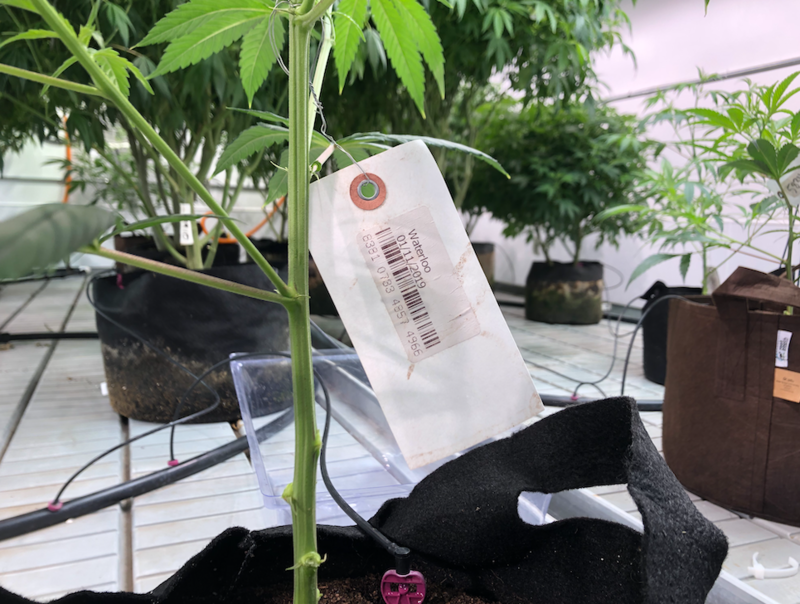 When it comes down to it both INSA growers stressed that indoor cultivation is easiest for new growers in Massachusetts. “You can control the environment better,” explained Golfieri. Fluctuating temperatures, long periods of cold or rain, and even unanticipated early freezes won’t matter at all to indoor plants (and more importantly, won’t impact your yield). It’s also far easier to control light conditions indoors. All that comes with a downside, of course: added cost. To keep plants healthy, it’s crucial to limit their exposure to contaminants. Change into clean clothes before entering your grow room, and keep a separate pair of shoes to avoid tracking in contaminants from outside. Beyond those general tips, though, there are best practices specific to the state. Water is an often overlooked source of contamination. If you’re not using filtered or distilled water, which both INSA growers recommend, be sure to get a complete readout of your town or city’s water supply. This can usually be done by contacting your local water and sewer agency. While you can test water from the faucet yourself for things like pH levels, a more comprehensive assessment will indicate things like lead and heavy metals, which cannabis plants absorb readily. Heavy metals are of particular concern in Massachusetts, home to a lot of former mill towns. When you’re dealing with new plants, you want to start with the best. So you might want to start by having the plant, flower, and/or soil tested by one of the labs in the state. Four labs are currently open for testing cannabis in Massachusetts, all in the eastern part of the state. Costs start around $50, and you can choose what type of analysis you’d like to run, from cannabinoid and terpene profiles to various safety tests that check for common concerns such as mold, E. coli, yeast, fungus, and more. 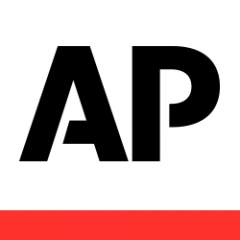 Banking, government and industry representatives at a House committee hearing urged lawmakers to pass a proposal that would allow cannabis businesses to access loans, lines of credit and other banking services, while sheltering financial institutions from prosecution for handling pot money. California Treasurer Fiona Ma, whose state is home to the nation’s largest legal cannabis market, called the measure a critical step for the rapidly expanding industry. For the cannabis enthusiast, this tried-and-true press can apply 12 tons of pressure to your flower. Built with steel, the Nug Smasher has two 4″ x 4″ heated plates that can handle up to 14 grams of flower in one press, making it ideal for homegrowers who are processing a lot of product. It has two 3″ x 3″ heated stainless steel plates that are operated with a manual lever, and it applies up to 6 tons of force on up to 1.5 grams of material. This press has a low input and is best for people looking to create small quantities of rosin with quality buds. 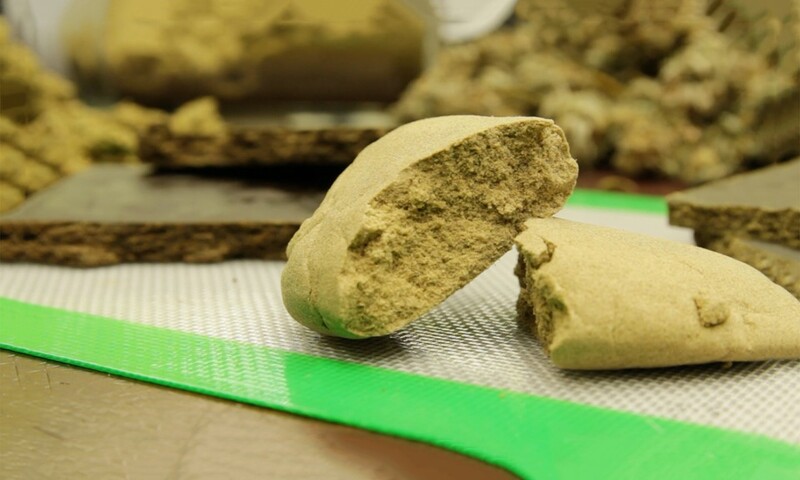 You can work your raw material–either flower or trim–into these framed screens to produce kief. Most kits come with a 149-micron screen and an additional, thinner 75-micron. And the reason we’re so optimistic, and we have bipartisan support, and the president said he’d sign [the STATES Act] into law–is because the polling is so over the top in favor. 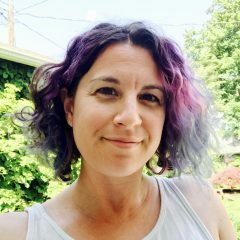 [Federal noninterference] is polling 10 points higher than legalization, and that’s the STATES Act — it’s polling in the mid ’70s, and that’s why I think we can get this done. Look the STATES Act is not the entire loaf–but it’s 60% to 70%. It fundamentally ends the conflict between federal and state law and it opens the door to have the conversation move from “Should we do this?” to “How should we do this?” The “How should we do this?” piece is full social equity. If you look at what’s going on in New York, New Jersey, Massachusetts, California–all the social equity pieces are happening locally. Denver is doing expungement. The state of Colorado is talking about stuff. So a lot of that stuff is happening at the state level, because that’s where the laws are. The STATES Act will speed up the pace of legalization in the states exponentially. The Cannabis Trade Federation has the largest-staffed lobbying team the industry has ever seen. If you would have looked at all the other resources that are brought to the table up to this point combined–it’s not as large as what we’re bringing. This is a huge boulder we’re pushing up a steep hill in a short amount of time. We think it’s doable, but we have no illusions about how difficult this is going to be.